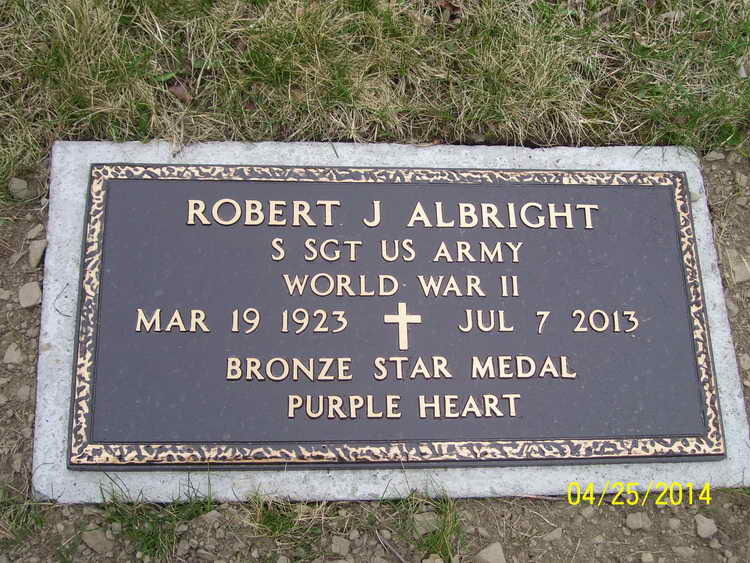 Robert J. Albright, 90, Indiana, Pa., formerly of Patton, passed away peacefully Sunday. He was born in Brownsville, son of the late Walter and Catherine (Ropp) Albright. He married Bernice Thomas on Oct. 29, 1947, in St. Boniface Church. Surviving are his wife; five children: Cathy Taylor and husband, Barry, of Pittsburgh, Robert Albright Jr. and Kathy Gray of Blairsville, Thomas Albright in Arizona, Richard Albright of Pittsburgh and Brian Albright and Rhonda Reiger of Homer City; five grandchildren; and two great-grandchildren. He was preceded in death by his parents-in-law, Leo and Mary Thomas; a brother, Mark; a sister, Leocadia Overberger; and a grandson, Dillon Albright. Bob was a U.S. Army veteran of WWII, having served with the paratroopers of the famed 82nd Airborne Division in the European Theater of Operations in Germany and Belgium. As a staff sergeant, he participated in the D-Day invasion of Normandy, France. Well known throughout the Cambria County area, Bob was a member of St. Mary's Catholic Church, Hastings VFW, Carrolltown American Legion and Carrolltown Fire Company Club and a life member and past president of the Patton Fire Company. He retired from North Cambria Fuel in 1988. Bob was a lifetime member of the Patton Camp. He enjoyed hunting, fishing, a cold beer, playing cinch, sharing his homemade sauerkraut and making friends laugh with his elaborate stories. Most importantly, he was dedicated to his family and friends. Friends will be received at 10 a.m. Thursday, July 11, 2013, in the Boniface Room of St. Benedict Catholic Church, Carrolltown, followed by a funeral Mass at 11 a.m. Military honors will follow by the Patton American Legion and VFW. In lieu of flowers, donations may be made to AseraCare Hospice, 1255 Scalp Ave., Johnstown, PA 15904. 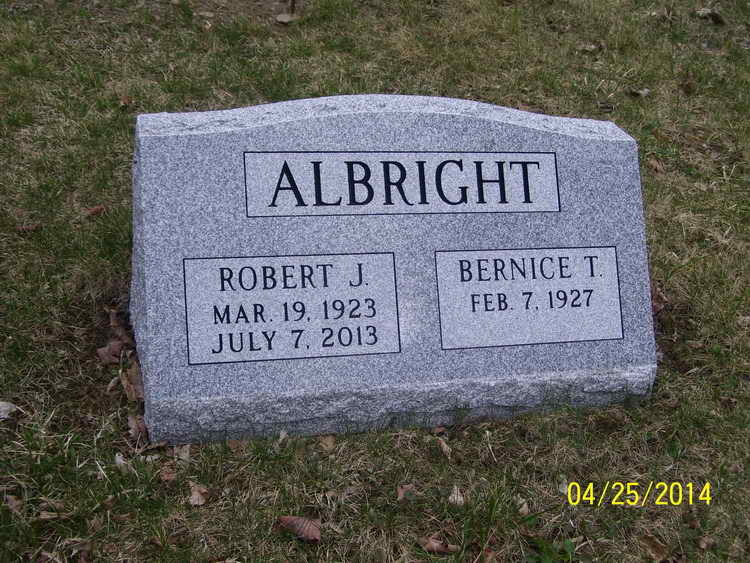 Grave markers for Robert J. Albright in Saint Benedicts Catholic Cemetery, Patton (Cambria county), Pennsylvania. Robert enlisted in the Army at Altoona, PA on 5 January 1943. Pvt Albright was then transferred from the Reception Center, New Cumberland, PA to Hq 3rd, 508h PIR on 19 January. Subsequently promoted to Pfc and then to T/5 on unknown dates, he was promoted to T/4 on 14 February 1944. T/4 Albright was slightly wounded in action on 4 November 1944 and rejoined the regiment on 26 December and was immediately transferred to Service Company for light duty. He was transferred back to Hq 3rs on 23 February 1945 where he remained until being shifted over to Company H on 1 April 1945. T/4 Albright's military awards include the Purple Heart, Bronze Star Medal and the Combat Infantryman Badge.